In order to gain further insight into the mechanisms of tissue damage during the progression of liver diseases as well as the liver preservation for transplantation, an improved understanding of the relation between the mechanical and histological properties of liver is necessary. We suggest that this relation can only be established truly if the changes in the states of those properties are investigated dynamically as a function of post mortem time. In this regard, we first perform mechanical characterization experiments on three bovine livers to investigate the changes in gross mechanical properties (stiffness, viscosity, and fracture toughness) for the preservation periods of 5, 11, 17, 29, 41 and 53h after harvesting. Then, the histological examination is performed on the samples taken from the same livers to investigate the changes in apoptotic cell count, collagen accumulation, sinusoidal dilatation, and glycogen deposition as a function of the same preservation periods. 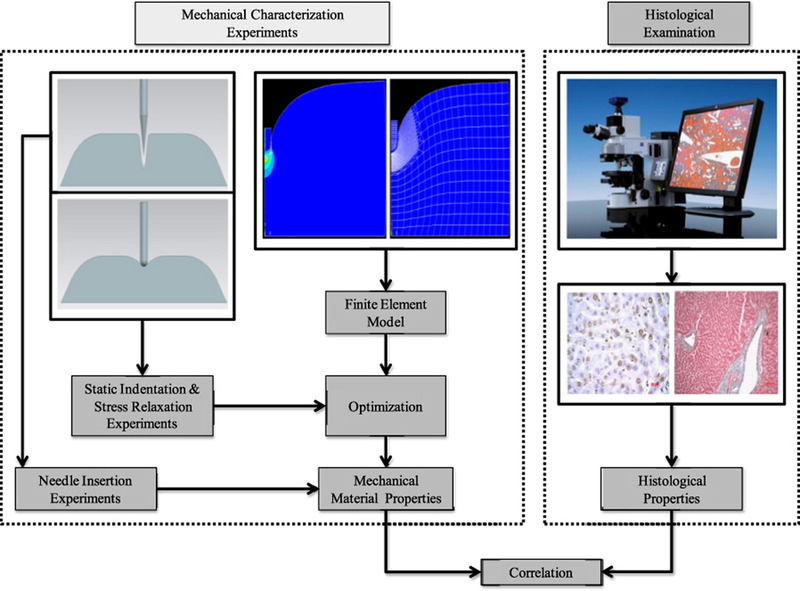 Finally, the correlation between the mechanical and histological properties is investigated via the Spearman’s Rank-Order Correlation method. The results of our study show that stiffness, viscosity, and fracture toughness of bovine liver increase as the preservation period is increased. These macroscopic changes are very strongly correlated with the increase in collagen accumulation and decrease in deposited glycogen level at the microscopic level. Also, we observe that the largest changes in mechanical and histological properties occur after the first 11-17h of preservation.